Back Bay Books, 9780316018807, 272pp. These hard-hitting, deeply felt stories trace men-- straight arrows and outlaws, have-it-alls and outcasts-- as they take stock of their lives and missteps and struggle to rise above their troubled pasts. A salesman considers his tenuous relationship with his sister after she has been brutally attacked. A house painter looks forward to moving his family out of their seedy neighborhood as he plans his last bank robbery. A drifter finds a chance at love when he delivers news of a barfly's death to the man's estranged daughter. These are hard-boiled tales of life on the edge in a city where the sun hurts your eyes and dreams die more often than they come true. 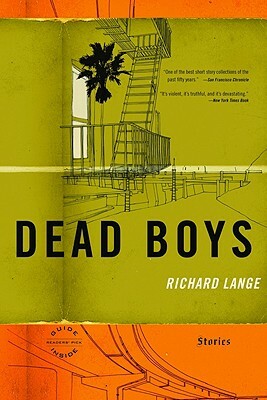 Full of heart and heartbreak, Dead Boys is the debut of an astonishingly talented new writer. "Superlative short fiction, and an arresting debut." Richard Lange's stories have appeared in StoryQuarterly, The Sun, The Iowa Review and Best American Mystery Stories 2004. He lives in Los Angeles.